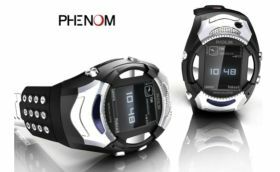 Phenom Communications has announced the launch of the most innovative gadget in the world which called as Phenom Watch Phone. The Phenom Watch Phone is an all in one cool and compact watch which include an unlocked GSM cell phone, MP3 and MP4 player, a digital camera and video camera. Besides that, it also features with built in Bluetooth for file transferring, an alarm, group messaging and even games. The Phenom Watch Phone also offers numeric keypad and 1.3 inch touchscreen. According to Phenom Communications, it plans to introduce between 10 to 12 new models in different styles and colors. Most of that will provide a GSM cell phone, USB port, touch screen, MP3 or MP4 and digital camera as well. The Phenom Watch Phone is priced approximate $295 but expected to find it at the price of $100 discount at this holiday season.